Easy, economical, and fun – what more can you ask for in a cooking experience? Creating baby’s first foods at home is not a new idea, but seems to have gained popularity as Americans continue to seek ways to save money. As with cooking for yourself, making baby food at home requires some advance planning and preparation. Once a system has been established, the rest comes easily. Tools for the trade include a reliable food processor or blender, ice cube trays or other freezing devices, and plastic freezer bags or storage containers. After cutting, chopping, steaming, or microwaving, pour contents into trays, label your container with food contents and date (some fruits and veggies last longer than others – most between 2 and 4 months), and reap the benefits of having prepared fresh food for baby! 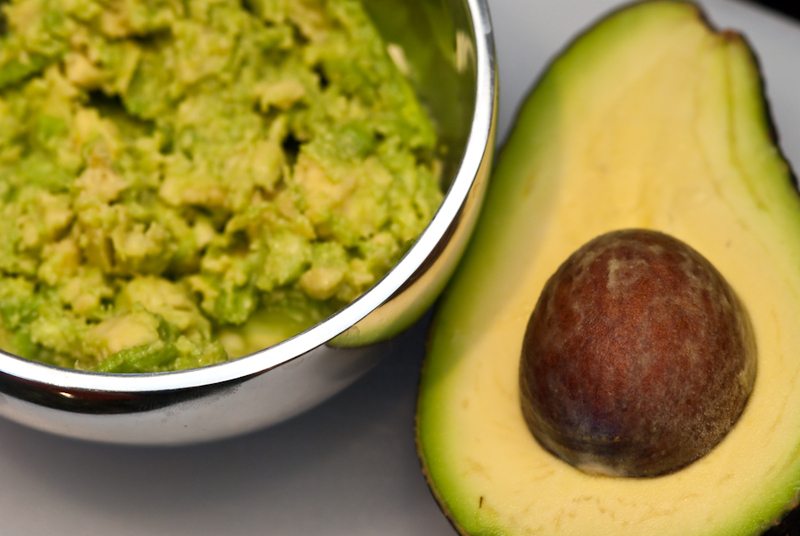 Great first foods for baby include banana and avocado – and there is no cooking necessary! Both are easily fork mashed, as you can see from the photo, and provide many required nutrients for baby, such as unsaturated fats (avocado), potassium, and fiber. Other mild fruits and veggies are good starters, but keep in mind the four-day-wait rule to check for any potential allergic reactions. It’s wise to double check with your pediatrician before starting many new foods, particularly if you have allergy concerns. After 6 months of age, baby’s digestive tract matures and a greater variety of foods can be added. Aside from fork-mashing, another simple way to cook veggies such as carrots, broccoli, squash, spinach, asparagus and green beans is with the following process: steam veggies on a pot or in the microwave for a few minutes until softened (use as little water as possible), puree in the food processor or blender, cool and store. The steaming process helps preserve the nutrients your baby needs, such as Vitamin C in broccoli and beta-carotene in carrots. Both antioxidants provide essential functions in development; Vitamin C builds collagen and helps maintain healthy skin, while beta carotene (a form of Vitamin A) aids in visual acuity. As always with fruits and veggies, more matters and remember to pick a variety of colors. A variety of colors means your baby is getting a variety of nutrients. Parents: do you have other baby food recipes or ideas to share with moms and dads? Please leave them in the comments section! Happy Eating! How Stacey Got the Shot: In the kitchen with the 105mm macro, flash bounced off the ceiling, ISO 800, f/7.1 in 1/40 second. Believe it or not, that vibrant green is natural, not the result of computer manipulation; I do minimal post-processing on all my shots.